For organizational purposes this survey will be divided chronologically into three periods: archaeological, historical, and contemporary. The earliest examples of prehistoric Siberian and northern North American art are from the pre-Eskimo groups of Chukotka and St Lawrence Island, Alaska. Among the best known are the small female figures from the Okvik culture (200 BC-AD 100) excavated at Ekven, Siberia, on St Lawrence and Punuk islands, Alaska. Carved from walrus ivory, the figurines are detailed with slashing geometric lines and the circle-and-dot motif. Because the figures have articulated breasts and genitalia, archaeologists think that they may have served in fertility rites. In addition to female figures, sophisticated renderings of polar bears, sea mammals, and birds are also known for Okvik. Slightly later, objects from the Old Bering Sea period (AD 100-300) excavated in these same locations register a stylistic shift to a more curvilinear style with the addition of raised bosses (Collins, 1937). Art objects from the Ipiutak culture (AD 100-600; see Ipiutak Culture; Norton Culture), centered at Pt Hope, Alaska, mainly highly decorated ivory "death" masks and small animal figures, seem to be more closely related to the Scytho-Siberian animal style of Eurasia than to the art of Bering Strait and Chukotka (Larsen and Rainey, 1948). Along the North Pacific Coast, the earliest artistic object from the Aleutian Islands is an ivory humanoid figure thought to be about 3000 years old excavated from the Chaluka Mound on Umniak Island. The figurine, about 12 inches high and hung by a thong inside the house where it was uncovered, suggests that it was associated with rituals. The Aleuts also made magnificent masks, which have been found in archaeological deposits in caves, usually in association with burials of important head men rituals (Black, 1982). In Canada and Greenland, the earliest examples of artistry are the miniature ivory or wood carvings from the late phases of the Dorset Period (1000 BC-AD 1300). Most typically 2-3 inches in size, Dorset carvings include humanoid masks, polar bears with skeletal detail, and bird imagery. The function of the pieces is unknown but one miniature wood mask is tinged with red, which may be ochre, a substance often used in shamanic ceremonies across the Arctic. Another hint at the function of Dorset objects is the skeletal markings on the Dorset carvings of polar bears. Polar bears were the most common helping spirit during Thule culture. Furthermore, to access the spirit world shamans had to reduce themselves mentally to a skeletal state (McGhee, 1996). 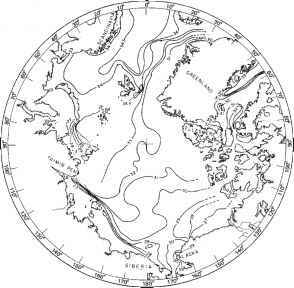 The Thule period (900-1200 AD), the immediate predecessor of modern Inuit/Eskimo culture, succeeded the early cultures of Bering Strait in the west and Dorset in the east. Arising between 900— and 1300 in northern Alaska and spreading rapidly eastward, Thule art shows some relationships with the earlier Alaskan cultures but little stylistic continuity with Dorset. Compared to the artistic output of earlier populations of Bering Strait, Thule-style art is greatly simplified in shape, and not so artistically detailed or sophisticated. Figures are more simply—sometimes more crudely—rendered. When surface decoration is present, the most characteristic motif is segmented lines and the circle-and-dot motif seen earlier in Okvik and Old Bering Sea objects. Among object types characteristic of the Thule period, small combs some 2% inches high, most having female imagery, are known from numerous sites across the Arctic, as are the so-called "Thule Birds," small ivory game pieces used by the Inuit and Eskimo groups from Siberia to Greenland (McCartney, 1979). Early prehistoric Saami art consists mainly of pictographs of hunters pursuing reindeer, moose, and other prey dating from as early as 4200. Later finds include asbestos-tempered red pottery, iron and bronze implements with simple decorative detail, and wooden sculptures of animals, birds, and humans appear to have been used in conjunction with religious ceremonies dating from about AD 1200 to 1400 (Molk, 1991: 8-11; 1997: 28-32).